There are many products out there that are surfactant or debubblizers. I’ve found both Almore debubblizer and Russman debubblizer on Amazon, or search for their home websites. The prices change quite drastically depending on where you find it at. If you don’t want to wait for shipping for those you can do another option which is to take a fine mist spray bottle from the health and beauty sections of your local store, and Jet Dry. Yes, the same thing you use for your dishes. Fill the bottle with water and add a few drops (like no more than 3-5 for a 2 oz bottle). You can then use that as a debubblizer as well, not as good as the professional ones but has the advantage of cheaper and your not waiting on something being shipped to you if you must start today building your terrain. There is a third possibility which I use because I keep forgetting to pick up the spray bottle. It is suggested to do this at least once to the mold once you purchase and clean it. Fill the Container with enough water to cover the top of the mold. Add a bit of Jet Dry into the water, I mix it up a little. 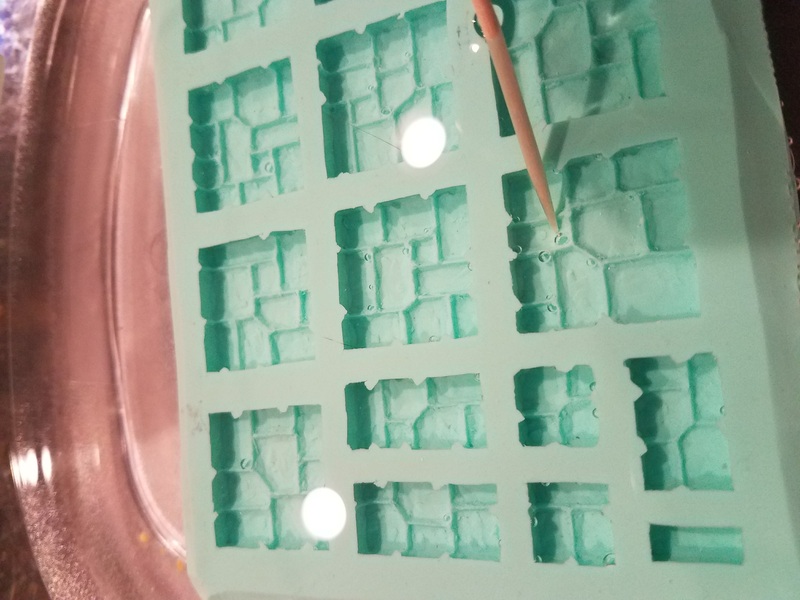 Once you place the mold into the water you will notice there are now little bubble along the edges of the mold. This is where the toothpick comes in handy. 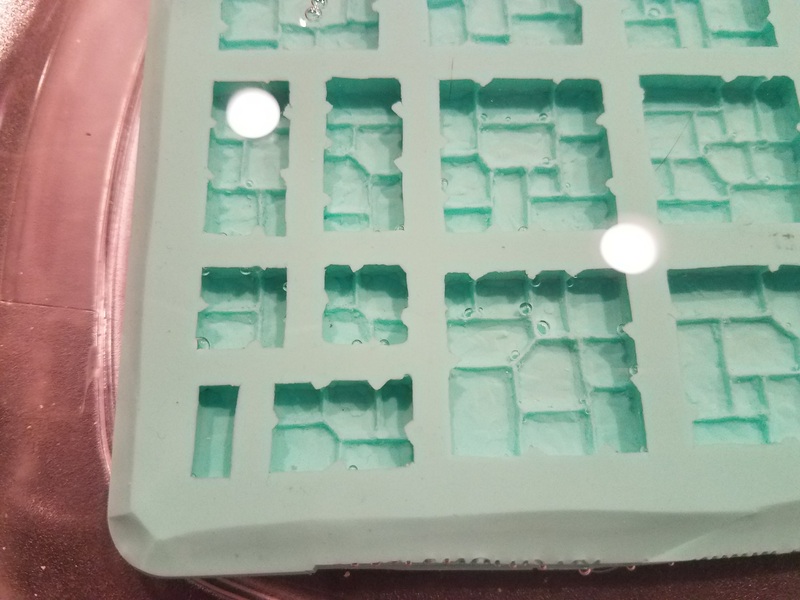 Push the bubble off the mold and then you are all set. Not really, I’ve used twisty-ties. Another suggestion is a plastic q-tip, my issue with that was as the cotton got wet it no longer moved the bubble off my mold and I’m just sitting there poking a bubble that is laughing at me (if bubbles could) and not moving. Your going to be good as long as it is something that will move the bubble and not damage your mold. Dry off your mold by patting it dry and you should be good to go.